Beautifully curved metal wires are bent to ensure optimal comfort in the Bertoia Side Chair by Inmod. A highly accurate replica of Harry Bertoia's original design, the Bertoia Side Chair boasts remarkable strength and unsurpassed comfort simultaneously. Choose from popular in-stock options or customize it to meet your needs, this chair is the ideal seating option for any living or dining space. In the 1950s, Harry Bertoia began experimenting with bending metal rods into practical art. This resulted in his now infamous seating collection, including his wire side chair. The Bertoia Side Chair is a high quality reproduction of Bertoia's original designed in 1952, offered at a price that makes it an affordable addition to your home. One of the most intriguing things about the Bertoia Side Chair is the disparity between its delicate, airy appearance and its actual strength and remarkable durability. This statuesque chair will also surprise you with its comfort. The Bertoia Side Chair makes an excellent addition to any room of your home, with a timeless look that has already proven to have remarkable staying power. LOVE MY NEW BERTOIAS!! BEAUTIFUL CHAIRS! THANKS! This is an absolutely stunning chair with classic design that outdoes most other reproductions. There are many replica Bertoia wire side chairs on the market, some of which come at a pretty cheap price point. I bought a polished stainless steel version from Inmod on sale, paying close to the price for similar models. This design is WAYYYY closer to Bertoia's original, not to mention its high quality craftsmanship. Clean welds and stunning finish. It works very well in rooms where space is limited and offers versatility, acting as a desk chair, extra accent chair when guests visit, etc. All in all, this chair's beautiful appearance, versatility, and quality make it a piece that could definitely see myself having and using for a lifetime. Cons- Not as ergonomic as it appears and may need a lumbar cushion if using as a desk chair, as the back is slightly reclined. Outstanding comfort - contoured seat makes a difference, VERY SATISFIED! Blown away by the quality of this reproduction! Looks like the real-deal!! Price was OUTSTANDING! Love my new Bertoias!! ALWAYS happy NEVER disappointed with orders from Inmod!! Love this site and love my new chairs. Quality, style, price and arrival time were all PERFECT! Thanks for never letting me down! absolute perfection - ordering experience was top notch!! THRILLED!! This has to be the FIRST TIME EVER custom order I've purchased from anywhere online has arrived in the time customer support said it would! I was unsure and it always puts me on edge a little bit especially because I travel for work and not home all the time for the deliveries - thank you x10! Its nice to bring a whole new look into my home, totally outside the realm of what I typically buy but they've turned out to be real attention grabbers in a good way and they make the dining room look like a brand new place, i'll most likely order here again the next time i'm ready to buy more furniture, thanks a bunch! I found these chairs advertised in the magazine ATOMIC RANCH. INMOD had them on sale at a price that was hard to beat. The chairs arrived carefully wrapped and in great condition. Would recommend them to others. ProsGood price with good quality. ConsWould like to have had more options for seat cover colors. Fantastic chairs. Great quality! I ordered the dark blue seat covers so they would be more comfortable and the color is perfect. Very happy with my purchase. ConsOnly con is that it took over three months to get them! ProsIt has feet that don't mark the floor. Seat cushion makes it even more comfortable. Matches my kitchen colors perfectly because I was sent fabric swatches before I purchased. I am a huge fan of Herman Miller designs, but their chairs were not within my budget. My husband and I live in a more modern style apartment and we wanted a chair that would fit with that vibe. When I found InMod I was sold - quality, beautiful design, and an affordable price. It took a while to receive our chair, but the wait was worth it. It is comfortable, sleek and goes perfectly in our space. I would recommend to everyone looking for a Modern style. Great quality chair, great price (free shipping is the clincher). No regrets. Ordered 4 of these for a dining area on my deck. While they aren't for outdoors, they do look great and I keep them covered when not in use. I got the black on black and the powder coat has a nice matte black color. I need a chair that will slide easily on very short nap carpet. I see the "buttons" added to the botton slide. I wonder if those "buttons" will keep chair from sliding easily on my carpet. The chair glides along the bottom of the sled frame are used to protect hard floor surfaces from scratching. These glides are smooth, and should not cause too much friction when being used over a rug. The Bertoia Side Chairs are not stackable. How do the seat and back cushions attach to the chair? The seat and back cushions attach to the chair with velcro straps. The Bertoia Side Chair is a reproduction of the original version designed by Harry Bertoia. Will these powder coated chairs hold up outdoors in the temperate California climate? We do not recommend using this chair for outdoor use. Although it would take a long period of time, especially in a dry climate, to show any signs of weather wear and tear, using the chairs outdoors would void the manufacturer's warranty. However, for an order with a Minimum order of 25 - we could customize the chairs to use a special type of powder coat and use hardware and cushion material that is suitable for outdoor use. We do have leatherette options for the version of this chair that can be made for outdoor use. For a large order, please contact us with your quantity needs and other specifications, and we will be happy to help you to customize the chairs for outdoor use. 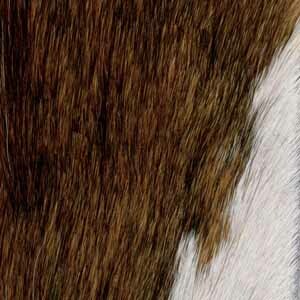 Is it possible to get a faux leather cushion? I'd like to use these for outdoor (bring them in during the winter). I live in Nevada and we get very little precipitation during the months these would be outside. Do you sell leatherette instead of leather cushions? I saw some mention of powder coating large orders. Is that indeed an option? 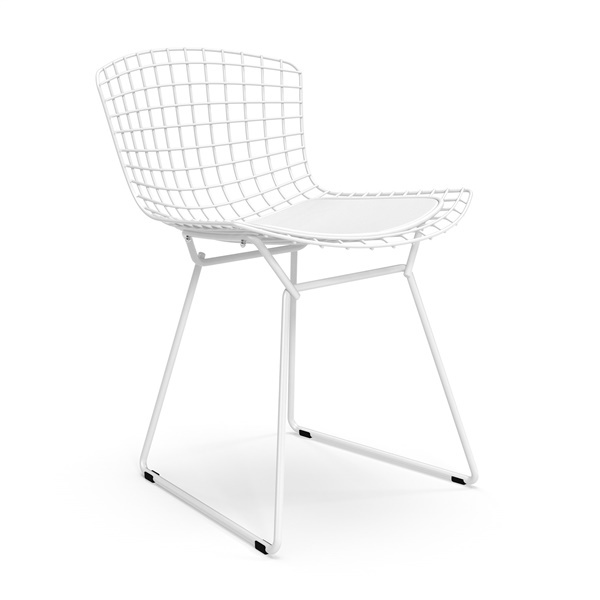 What is the weight limit of the Bertoia side chair? Can this chair be used outdoors without the cushion or with a vinyl cushion? Can you all do a vinyl seat cushion? Unfortunately this chair is not made for outdoor use. If you are looking to purchase a large number of chairs, please reach out to us and we can help you customize this chair for outdoor use. Hi, I have never sat in one of these types of chairs but I like the look. Is there ever a problem of the wire bar hitting the back of the thigh and/or being uncomfortable due to the wire frame? What has the feedback been of these chairs? Also, they are only 17" high. Is this standard? Our Bertoia chair is a highly accurate reproduction. We have received great feedback for our chair including the comfort level. There are many reproductions on the market that are not made well and that have the problem of the wire frame being uncomfortable and that is not the case with our classic. The seat height of 17" is standard and it is measured to the lowest point of the seat as it is curved.